The YieldPro system is a value-added, service-focused program to benefit your business. With the help of our skilled precision ag team, YieldPro combines your yield data with local soil sample data and technical seed data from the Answer Plot® program to help develop customized prescriptions for seed and crop nutrients for each of your fields offering a complete Rx solution. YieldPro's foundation revolves around data. Yield data is the guiding force behind our nutrient recomendations. A strong data archive provides our agronomic team the best understanding of your fields nutrient history. A historic look at field performance is crucial but, so is understanding its current nutrient needs. Soil is the starting block to the YieldPro system. Before making any recomendation, our specialist take an extensive soil inventory. A final pillar in our YieldPro system is consultation. A successful program is only as good as the conversation put in with our customers. Our trained agronomists consult with you to best understand your needs as the farmer. Putting your goals as the top priority, together we build a plan to satisfy your needs and the needs of each field. Contact your nearest Harvest Land location to see how the YieldPro system can unleash the potential in your fields. Harvest Land offers our field tech support, bringing another level of depth to your in-season monitoring program. Field Techs are not a scouting program. With this offering, trained specailist montior and note your fields plant health. Allowing for close observation of potential disease pressure as well as opportunities to fine-tune your nutirent program. Giving you and our agronomists pinpoint accuracy for custom field managment. All of this seemlessly communicated in a variety of ways. One of which being OpenScout, our digital communication platfrom used to share all field observations. See below to learn more about our OpenScout technology. Harvest Land is proud to use Open Scout as our field report program. The platform provides digital communication to seemlessly share all notes and photos taken throughout your field. All recorded information is time-stamped and geo-tagged to offer precise visualization of your report. Offering pinpoint accuracy for your application and decision making needs. Our program allows for your notes to be retrieved either mobily or through the web which, mitigates time when response for action is critical. To learn more about our field report program contact your local YieldPro specialist. Using drone technology allows our Harvest Land agronomists to get a birds eye view of your farm. Offering the capability to upload images taken to create high resolution maps and 3D imaging. With Drone Deploy, understanding your fields over all health becomes efficient and painless. Contact your local YieldPro Specialist to see examples of our drone footage. Harvest Land precision technology experts leverage unbiased, data-driven insights from the R7® Tool to help make important planning and in-season decisions on your farm. Soil maps and satellite imagery help identify more productive areas within your fields, while years of Answer Plot® data within the tool help guide in efficient in-season management and seed selection during the planning season. Harvest Land offers AirScout as an aerial imagery resource. AirScout is an Indiana farmer born technology. Using patented thermal imagery, plant temperature can be measured throughout a field. Allowing a reading of field variation will help idenitify pest and disease pressure. Catching problems before they take hold of your crop. Airscout technology allows our trained agronomists to not only identify problem areas but, find cost effective solutions with advanced warning. To learn more about our AirScout offering, reach out to your local YieldPro specialist. Who you partner with for your precision farming technologies is an important decision. Ag Leader has been a pioneer in precision farming since the very beginning. 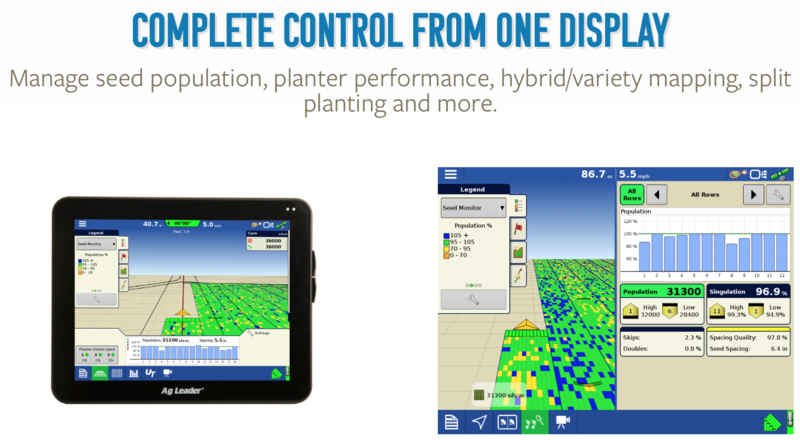 In fact, Ag Leader has the most complete line up of precision farming technology available - both hardware and software. Ag Leader's team of dedicated support and training specialists - including Harvest Land Co-op's Mike Reed right here in Richmond - are behind you, granting you access to the best precision farming support in the industry. Harvest Land is a Premier Dealer for Precision Planting equipment. Precision Planting specializes in solutions and equipment – such as monitoring, metering, depth control, real time data and profit analysis – to improve the planting system and help you succeed in the field. Harvest Land and Precision Planting will work together to provide you with innovative products and solve important agronomic issues facing your farm. Contact our YieldPro office at 765-962-8781 for more information. Our YieldPro program is a prime example of sustainable practices to preserve the potential of every acre you farm. Harvest Land Co-op has been helping farmers implement sustainable farming practices for decades. Our sustainability model consists of the four R’s: the Right fertilizer source at the Right rate, at the Right time and in the Right place. Properly managed fertilizers support cropping systems that provide economic, social and environmental benefits. On the other hand, poorly managed nutrient applications can decrease profitability and increase nutrient losses, potentially degrading water and air. 4R nutrient stewardship requires the implementation of best management practices that optimize the efficiency of fertilizer use. The goal of fertilizer best management practices is to match nutrient supply with crop requirements and to minimize nutrient losses from fields. Selection of best management practices varies by location, and those chosen for a given farm are dependent on local soil and climatic conditions, crop, management conditions and other site-specific factors. Contact one of Harvert Land’s YieldPro experts to learn about the 4R model.